Air temperature is one of the most important environmental measurements and is the most commonly measured parameter on weather stations. Everyone who measures temperature in their yard can claim to have a basic home weather station. The temperature of surfaces is considerably more challenging to measure accurately, but the temperature of plants, soils and road surfaces can tell us far more than just a simple measurement of air temperature. The Apogee Infrared Radiometer (IRR), measures surface temperatures by the infrared radiation emitted from them. The accuracy of this sensor is ± 0.2°C, but errors can arise when the sensor body is not shaded from direct solar radiation. IRRs can more accurately measure the surface temperature of an object when the sensor body itself is close to the target temperature. The Apogee calibration process accounts for surface temperatures that are 15 C above or below the sensor body temperature. The rule of thumb, however, is that the measurements are more accurate when the sensor body is closer to the target temperature. The question then arises: how can I keep my IRR sensor closer to the target temperature? Apogee recently developed a radiation shield that can be used with our IRR models. This shield keeps the temperature of the sensor closer to the target temperature. As a Mechanical Engineer, I was asked to take the lead in engineering the details of this shield. In order to ensure structural stability, performance, and minimize heat transfer to the IRR sensor, aluminum and nylon were chosen as the chief materials for the shield configuration. Relative to other metals like carbon steels, aluminum has a lower volumetric heat capacity (the ability to store thermal energy), and higher thermal conductivity (ability to conduct heat and thus maintain a uniform temperature across the aluminum). In addition, aluminum is lightweight and robust, thus allowing a smaller amount of material to be used in the wall thickness. Glossy white powder coating allows for a high albedo (more reflected radiation), thus minimizing the thermal radiation absorbed. Nylon screws and spacers are used to attach and suspend the IRR sensor within the shield. Nylon was chosen since it has a thermal conductivity approximately 1000 times less than aluminum, thus minimizing the conduction that occurs from the shield to the IRR sensor. When the IRR sensor is mounted in the aluminum shield, an annulus configuration is formed with approximately 6 mm (0.25”) spacing between the IRR sensor and shield. This spacing is sufficient to allow natural and forced convection to keep the sensor body as close as possible to the air temperature, and thus generally closer to the target temperature. The shield extends 14 mm (0.5") beyond the front edge of the sensor base housing. This overhang helps to keep the front of the sensor in thermal equilibrium (at the same temperature) with the rest of the sensor body by shading it from direct sunlight. The overhang distance was carefully selected so it does not affect the field of view of the sensor. Using the shield appropriately can result in lowering the sensor body temperature 3 to 10°C, giving you better measurements. Currently, the Apogee Radiation Shield, Model AI-100, ships with all newly purchased SI-100 & 200 series IRR sensors, or can be purchased separately as an upgrade to be used with any previously purchased IRR sensors for $39. 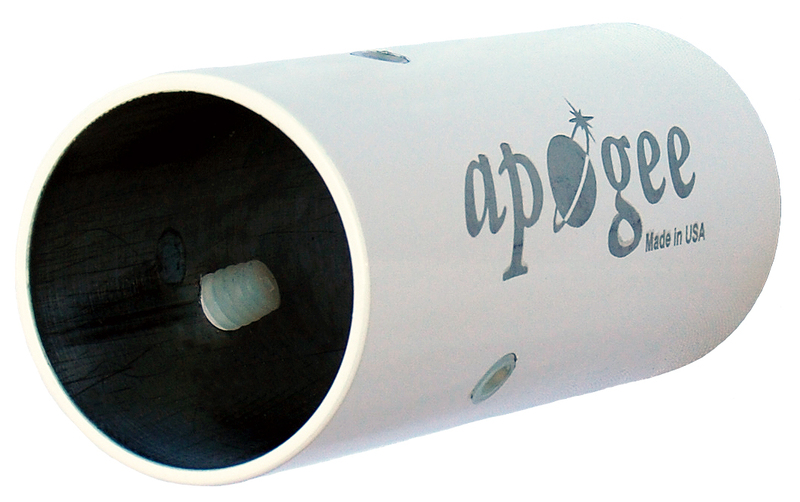 The Apogee Radiation Shield – engineered to help you make better measurements.